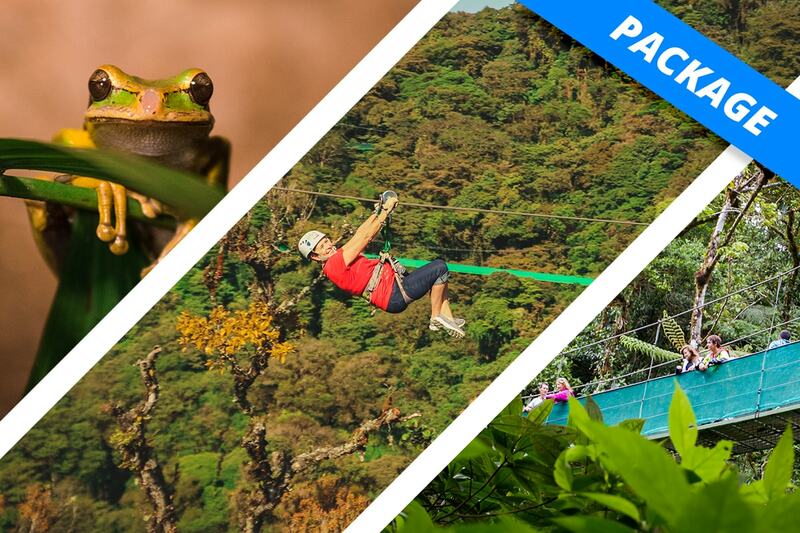 Sky Trek is a thrilling zip line circuit that’s located in the magical forests of Monteverde. Your tour will start riding an open-air gondola from the ground to the highest point of the mountain where you’ll be dropped off at an observation area to admire fantastic views of the surrounding forests, the Arenal Volcano on one horizon, the gulf of Nicoya at the other. From this area, you will start riding down a unique zipline circuit that stretches across canyons, going from one mountain to another, and in between treetops. It truly is an exhilarating adventure of zip lining down the mountains. At our Sky Trek in Monteverde, you ride the tram up the mountain, and then get back to the base riding our thrilling ziplines, making it a perfect adventure activity with no walking segments – get off and jump on to the next cable. You’ll ride 8 cables that go up to 100m (328ft) in height and 750m (2460ft) in length where you will be astounded by its impressive heights, speeds that go up to 70km/h (43.5mph), views, and because you will be able to admire the surrounding mountains like in no other place. Sky Walk offers a more peaceful introduction to exploring Monteverde Cloud Foreston a 2.5km (1.5mi) circuit trail that snakes through distinct levels of the wonderfully diverse ecosystem. basilisk, hourglass frog, and the famous red-eyed tree frog.